Home / Stories and Information / Buying Tips / Ruby. The July Birthstone. In the ancient language of Sanskrit, Ruby is called Ratnaraj, translated as king of precious stones, which comes as no surprise. Rubies have long been treasured as a precious stone by ancient and modern cultures for their deep red colour. They are a variety of the mineral corundum, which is also shared with sapphire. The word ruby comes from the Latin word ‘ruber’ meaning red. Myanmar (Burma), has produced some of the finest rubies, prized for their vibrant red and glowing fluorescence. In Burmese legends, rubies were used as protection for warriors going into battle. They believed the gem would make them invincible. However, it was not enough just to wear the ruby, they had to be inserted into their flesh to become part of their body. The world’s most expensive ruby ever sold, the Sunrise Ruby, was originally mined in Myanmar. The 25.59ct is described as ‘pigeon blood’ in colour meaning it shows pink to blood red tones. It was mounted into a ring by Cartier, set between two heptagonal diamonds. Sotheby’s sold the ring in 2015 for US $30.42 million. Other famous rubies include The Liberty Bell Ruby, the largest ruby ever mined. Found in east Africa in the 1950s, it is eight and a half thousand carats and weighs four pounds. Sculpted into a miniature form of the Liberty Bell, the ruby was stolen in a heist in 2011 and has still not been recovered. Elizabeth Taylor’s Cartier ruby and diamond jewellery suite, which was sold at Southerby’s in 2011, included a 8.24ct ruby ring that broke the ‘price per carat’ record for rubies at $512,925 per carat, with the ring selling at over $4.2 million. 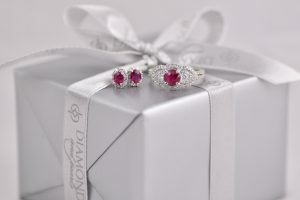 Ruby is the birthstone for June but is also the 15th and 40th wedding anniversary gift. Shop our ruby jewellery here. 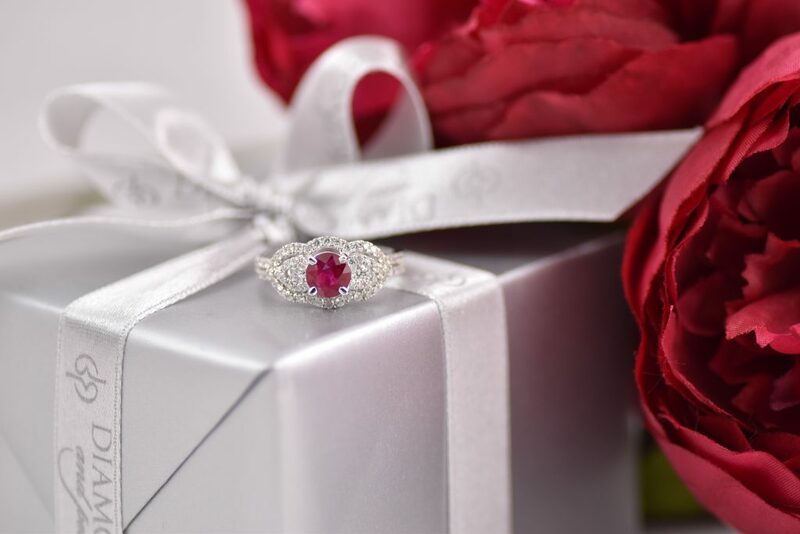 View the ruby and diamond image feature ring here. View the ruby and diamond earrings here.